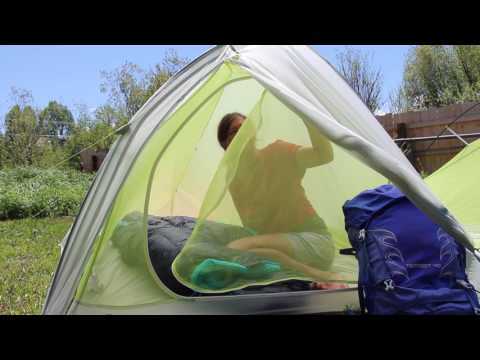 An all-mesh canopy makes the Fly Creek HV Platinum 1 even lighter than its UL cousin. For under 800g, you can enjoy an almost free-standing shelter, complete with a vestibule to stash your soggy stuff or use as a porch to put your boots on. On warm, cloudless nights you can leave the fly off and fall asleep looking at the stars. Made of feather light silicone treated ripstop nylon with a polyester mesh canopy. All seams are sealed with solvent-free polyurethane tape. Angled pole hub creates steeper side walls and more interior space. Nearly free-standing design requires the 2 foot corners pegged out. Side access vestibule entry keeps your gear dry. 3 interior mesh pockets organize your small items. Reflective guylines and tent corners for easy night-time location. 11 lightweight aluminum J stakes included. Optional footprint available for floor protection or an ultralight configuration. Compatible with the Big Agnes Triangle Gear Loft (sold separately).